I’ve been reflecting a lot recently on freelancing. Maybe it’s because it’s coming to the end of 2013, and reflection is compulsory. Maybe it’s because I’ve mixed things up with a part time training role, working with graduates at the very start of their careers. Or, y’know, maybe it’s because I haven’t blogged in a while and the self-imposed guilt is eating me up a bit. But I’ve come to the conclusion that many of the lessons I’ve learnt over the last few years of freelancing, are lessons I can apply to other areas of life. One of the things I often hear from new freelancers, or freelancers moving into a new market, is that they’re not ‘good enough’. Imposter syndrome, where you believe someone will find out you’re actually rubbish and will tell everyone else, is pretty common in freelancing. But talent can be developed and practiced. The key to success is obvious yet often undervalued – hard work. Just because you’re not good at something straight away, doesn’t mean you’re not talented. Realising this made me approach new opportunities, tasks and skills in a completely different way. Once you realise that most ‘talents’ can be learned, the options become almost unlimited. I’m a chronic procrastinator when it comes to certain tasks. But if freelancing has taught me anything, it’s that life is a lot easier if you tackle the hard stuff first – whether it be ringing a scary client, doing your finances or running a report. Eat That Frog (check out this video for what Eat That Frog is) is a principle that applies to every area of life – and it honestly makes a huge difference to how organised and productive you are. 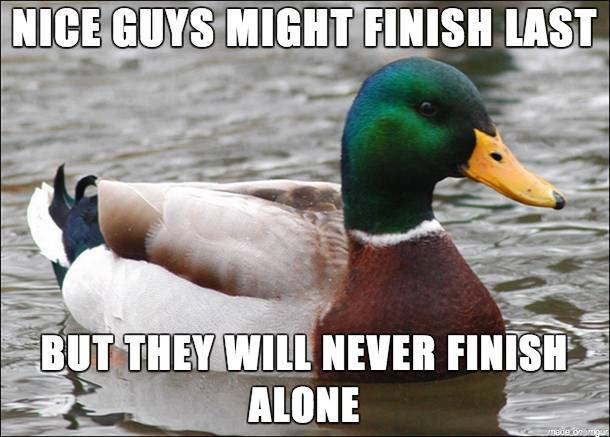 Nice guys might finish last…. I love this meme. I’ve met lots of lovely people while freelancing. But also some total prats. And the total prats are sometimes, frustratingly, extremely successful. This obviously doesn’t mean that all of those who are successful are prats, but the feeling of ‘it’s not fair’ creeps up more often when their douchebag levels are on high. But if you get ahead by treading on those below you, or by generally working in a shady manner, you might take home the money but you’re unlikely to have a happy life elsewhere. Don’t feel bad for being a nice/friendly/kind person. You win in the end. This one is something I’ve learnt from both my own point of view, and from working with clients. From my own point of view, I have a tendency to honestly believe I can hit a short deadline in time. The reality is – this isn’t always possible (well, not without driving myself batshit cray cray). Equally, many clients will tell me they’ll send over feedback in a certain timeframe – but miss the deadline. The truth is, both parties honestly believe they can achieve something. The intentions are good. But they’re not always realistic. In other areas of my life, I realised I often make optimistic, positive promises – which I failed to fulfil. Whether it be calling my sister straight back, or, arriving on time when I’m running late or, crucially, earning enough to pay my bills one month. This one is a work in progress, but sometimes it’s about giving yourself and others a little slack. One thing I’ve been doing a lot less of in 2013, is planning. In January 2013, I realised I often spent so long planning projects/new ideas, that I never got round to actually doing them. The planning became the procrastination. So this year, I made the decision to plan as I went along. Instead of spending months planning I would spend just an afternoon planning it, then get working on it – whether that be mentioning it on social media, starting the creation process or emailing friends to bounce the idea off of. Once I started doing this in my freelance working life, it started to roll over into the rest of my life. The honest truth is I get far more done when I don’t plan as much. And if something goes a little wrong, I have the flexibility to try something different. What life lessons have you learnt from freelancing?